All aboard for our first local Food Truck Fiesta! 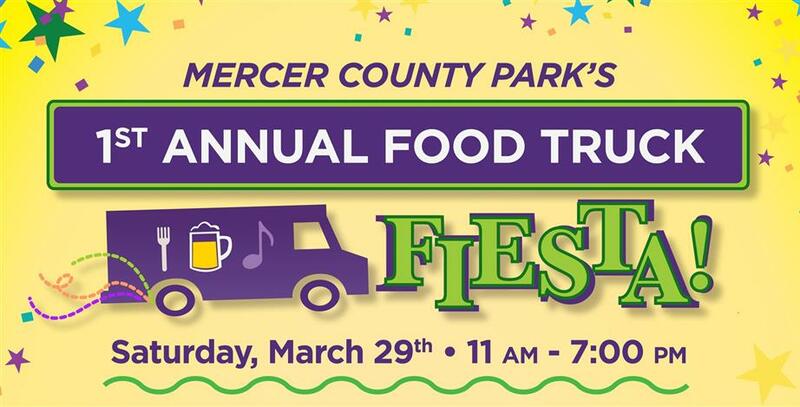 Just when my editor at the Packet and I were bemoaning the lack of food trucks in our area, we got notice of a March 29 Food Truck Fiesta coming to Mercer C0unty Park on March 29, 11:00am-7:00pm – yay!! Spring is in the air and it smells delicious! There are not many places where you can indulge in delicious lobster rolls, rosemary marinated steak sandwiches, gourmet sliders, fried Wisconsin cheese curds, slow smoked barbeque ribs & pork sandwiches, chili, yak burgers, Mexican tacos, vegan salads and smoothies, tater tots, Korean BBQ, gourmet cupcakes and melt in your mouth, made on the truck donuts all in one place. The area’s best food trucks are scheduled to roll into Mercer County Park for the first Food Truck Fiesta on March 29th from 11am to 7pm. (Rain or Shine) The event will not only offer delicious food, but also a variety of children’s activities, such as a portable rock wall, bounce houses, pony rides, petting zoo, and an all- ages interactive art installation. Unionville Winery from Ringoes, NJ will be bringing some of their 22 different varietals of wine to pour with the great food. Live music for the First Food Truck Fiesta will feature local band Kindred Spirit and Hamilton native DJ Ramona. So whether your choice of beverage is wine, or a soft drink, make sure to enjoy the music with your gourmet food. Food trucks that are participating in this year’s event include the following: Surf and Turf Truck, Cow and the Curd, Cupcake Carnivale, Fred’s Kitchen, Kevin’s Salad Station, Lombardi’s Pizza, Dark Side of the Moo, Oink and Moo BBQ, The Outslider, The Taco Truck, The Tot Cart, and Underground Donuts. Okay, I’m not so sure about that last part, but that’s what the press release said!